Editor's Note: Herman's House premieres in theaters April 19, 2013, through First Run Features. The following article, by Angad Bhalla, the film's director, and composer Ronen Landa, was first published in the Fall 2011 issue of Documentary magazine. Here, Bhalla and Landa discuss the process of developing ideas for Herman's House, then a work-in-progress at the Sundance Institute Composers + Documentary Lab. The Sundance Institute Composers + Documentary Lab offers a unique opportunity for documentary filmmakers and composers to explore the role of original music in nonfiction filmmaking. Built upon the Sundance Institute Lab model launched in 1981 by Robert Redford, Fellows participate in an intensive, residential retreat focused on creative support with mentors, including leading film composers and documentarians. First held in 2002, the Lab has evolved to be a stand-alone week with a dual focus on film composition and nonfiction story structure. The Lab is a collaboration between the Sundance Institute Documentary Film Program and Film Music Program. This year's edition took place July 6-12, 2011 at Sundance Resort in Sundance, Utah. Four Sundance Institute Documentary Film Program grantee projects were paired with four emerging film composers specifically interested in documentary. 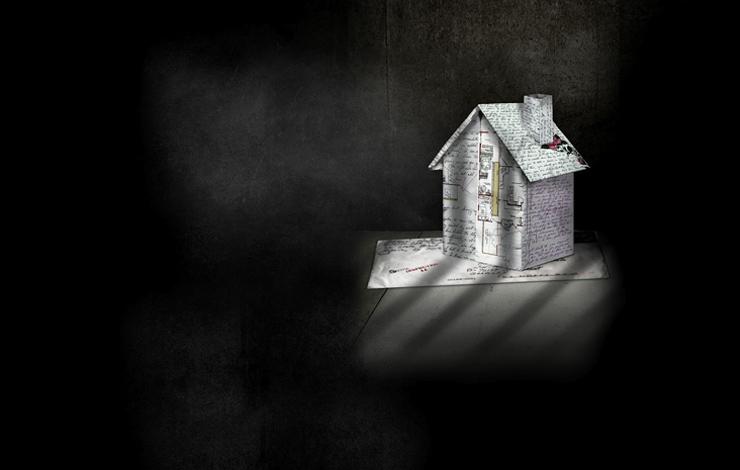 One project was Herman's House (formerly The House That Herman Built), which captures the remarkable creative journey and friendship of Herman Wallace, who has been imprisoned in a 6-by-9-foot cell for over 30 years, and artist Jackie Sumell, who creates an art project that examines the injustice of prolonged solitary confinement. For the Lab, Herman's House director Angad Bhalla and editor Ricardo Acosta were paired with composer Ronen Landa. Thanks to the gently persuasive efforts of Cara Mertes, director of the Documentary Film Program, and Peter Golub, director of the Film Music Program, Bhalla and Landa agreed to share their thoughts and memories about the program and give the reader a sense of the creative process in this particular context--how the project evolved over the six days, what the challenges and break-throughs were, how the mentors worked with the composers, what the expectations were, and how the six days impacted the composer's practice and process. Sitting around a table on our final day at the documentary composers lab, we were asked what elements of the program could be improved upon. It was a fair question, but I could not isolate any aspect of the schedule, critiques and presentations that called for improvement. For me, the lab staff and advisors had created an indelible, imaginative experience. Initially, my editor Ricardo and I had only been selected for the Institute's Documentary Edit and Story Lab. On our second day at that lab, Cara Mertes invited us to return and participate in the upcoming Composers + Documentary Lab. Though we knew we were opening up our film's music to being lovingly deconstructed and bombarded with suggestions for improvement--much as the editing advisors had just begun to do to our film's structure--we were excited to have the opportunity to dissect our ideas for a score in a forum like the composers lab. As we have no access to the Louisiana prison where Herman is still incarcerated, he exists on screen only through his audio recordings. We have always felt an additional pressure on our film's overall soundscape, with an original score playing an integral role. When we arrived at the lab, our heads were still spinning from the edit lab, and visions of floating plot points kept us up at night. For the first couple of days, while it seemed other folks were busy orchestrating arias, we just screened footage with our composer, Ronen, and discussed our characters' motivations. Before the lab, my biggest worry had been that any composer we were paired with would not be able to understand our film, having only worked with it for five days. In some ways, after the story lab I was only beginning to understand the film myself, and I'd been working on it for four years. Ronen assuaged my fears quickly. Hearing his early ideas for our scenes, he clearly understood the spirit of our characters. We exchanged notes and made minor changes, but much of Ronen's music held up. As a filmmaker, my basic understanding of score changed significantly during a spotting session with Peter Golub. After watching our second scene with temp music, Peter suggested we watch it without the temp. The scene came alive without music, and we realized that the temp had inadvertently caricatured our subjects. We had been using temp that reinforced feelings that were already present in the scene. While this wasn't wrong, Peter explained that the score could also enhance sub-textual emotions that buoy our character's overall arc but were not overtly present in the scene--adding depth to the characters. Then Peter took us to another level. He got up on stage, sat down at the grand piano and asked to watch the scene again. For the filmmakers reading this, if the opportunity arises, I highly recommend watching a scene with your composer improvising a score live to picture. Something about hearing the energy of live music with my film revealed new possibilities of how music could add dimension to the story. Over the next few days, conversations ensued--well, first conversations and then conversations about conversations. But guided by the experience that our advisors Vivien Hillgrove, Martin Bresnick, Jon Else, Peter and Cara brought to the table, each conversation built on the last. And the table was often not figurative. Many of the most meaningful conversations did not happen sitting in front of workstations, but over fajitas at lunch or beer at the Owl Bar. Which brings me back to my confusion with being asked what elements of the Composers + Documentary Lab could be improved upon. I can confidently answer: More fajitas and beer. I'd heard great things about the Sundance Institute for years, but it wasn't until my first trip to the Sundance Film Festival this past January that I began to glimpse the full force of spirit and passion that drives this organization. Needless to say, I was thrilled when Peter Golub invited me to this summer's Composers + Documentary Lab. Scoring documentaries has been a most rewarding facet of my music career, and given the opportunity to spend a week in the gorgeous mountains of Utah doing what I love... Well, what could be better than that? From the outset, the advisors stressed that the lab's focus was squarely on the process of collaboration, not the final product. And while I was certainly looking forward to working alongside my appointed filmmakers, I also knew that I'd want to give the scoring efforts my all. Working on film music without the real-world constraints of deadlines and budgets is a true joy, and I wanted to make the most of my chance to experiment risk-free. The first few days of the lab were jam-packed. Each of the composers and filmmakers presented their work, as did the advisors. Meals were peppered with deep philosophical musings, and there was very little downtime. I met with Angad Bhalla and Ricardo Acosta, director and editor, respectively, of The House That Herman Built, and we managed to squeeze in a couple screenings of the film. We also had a group spotting session, where fellows and advisors picked apart the film's temp music and suggested some possible new directions. I started to wonder (usually aloud) if I'd ever have time to actually write some music. Apparently one can spend many, many hours analyzing a documentary's narrative arc--who knew?! The ideas offered were certainly all worth considering, but good music takes time to finesse, and I was anxious to get to work. As it happened, I didn't have much to worry about. While immersing myself completely in the world of Herman's House, I had probably begun scoring it subconsciously, so once I finally did have a few hours to compose, the music poured out. We selected two scenes to work on, and each had its own challenges. In the first, I was charged with accompanying Herman Wallace's voice as he described the circumstances that had landed him in prison. I chose a subtle, nostalgic and quietly hopeful sound palette to emphasize his sense of regret and time lost without discounting his personal determination. The second scene featured a parallel explanation from artist Jackie Sumell as she described her childhood. I realized there was a danger in overwhelming the visuals with a strong melodic statement, so I composed sparse, somewhat ambiguous music for solo piano to accentuate her interview just enough. I also developed a unique, vibrating tremolo tone with my electric guitar that I utilized in both cues to help create a sense of continuity between them. I initially sought feedback from fellow composer Heather Schmidt, and also from music editor Scott Johnson. Then I asked our advisors, Golub and Martin Bresnick, to come by and take a listen. It's always exciting and a touch scary to present my music to accomplished composers whose work I admire, but the meetings all went very smoothly; they liked my approach to the scenes and only suggested a few minor fixes. That meant it was finally time to share my efforts with Angad and Ricardo. We played through each cue a few times so they could adjust to the new music, and I was relieved to see that the director and editor were both on the same page and, better yet, on board with my overall concept. But I wasn't totally in the clear just yet. Their intimate knowledge of the film started informing all kinds of subtle musical ideas. What if we delay this entrance? Swap out that instrument? Ramp up the tempo? At some point between the stunningly beautiful hikes, we found time to experiment with variations on my original efforts, make a few additional tweaks, and discuss our work with advisors Cara Mertes, Vivien Hillgrove and Jon Else. Extrapolating from the earlier themes, we even managed to demo up a third cue for a scene describing Herman and Jackie's first written correspondence. By the end of the blab, I was thrilled with just how well the music complimented the picture. Angad and Ricardo deserve a ton of credit for the music's success. Throughout the entire process they remained open to my ideas and clearly communicated the films' dramatic needs to me, as well as their honest impressions of my work. Ultimately, a commitment to communication and exploration allowed us to unite our art forms into a singular expression. It was that depth of collaboration, I discovered, that was the real blessing of our time at the lab. Angad Bhalla is drawn to film for its ability to have an emotional impact, and he chooses projects that highlight voices we rarely hear. Past projects include U.A.I.L. Go Back and Writings on the Wall. He resides in New York where he works as an editor, video producer and community organizer. Ronen Landa (www.ronenlanda.com) is a film and concert music composer. Documentaries featuring his original music include Burning in the Sun, The Dreams of Sparrows and City of Borders. His debut score compilation album, Picturebooks, was released in 2009.